Heloderma are closely related to the family of Anguidae ! Phylogenetic relationships of squamates inferred from DNA sequences of nine nuclear protein-coding genes. Branch lengths are proportional to time. Values in bold above branches are ML bootstrap values. Values in bold below branches are Bayesian posterior probabilities. Values in italics next to nodes are time estimates (followed by error range). ASSLAR The Gila Monster. with the latin name of Heloderma suspectum and it's light markings on a black background, is very beautiful. ASSLAR The Gila Monster, with the scientific latin name of Heloderma suspectum, exemplified by the reddish-pink markings on a black background, is a very beautiful lizard. Generally speaking these animals, reaching a length of 60 cm just under two feet), are very friendly. Nevertheless, it is important to handle them with caution as they are venomous. A person who knows these American animals very well, is Dr. Hans-Joachim Schwandt. "Some time ago I simply fell in love with these fellows" explains the pharmacist, who has successfully maintained and bred Gila Monsters with a special permit. Hans-Joachim Schwandt retired in 2001. 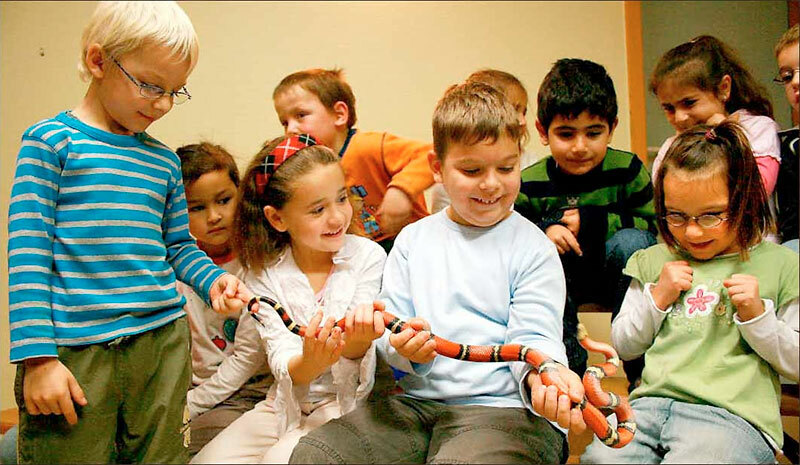 Up to that point in his noteworthy life he was the supervisor of the laboratory at the Giessener Center for Children Diseases, Justus-Liebig-University, and now looks back at forty years experience with reptiles. This is immediately obvious when we look at bis collection: In the rooms of this expert, who is deeply involved with the scientific aspects of these lizards, one finds a sequence of roomy terrariums with plenty of sand and hiding places. The entire setup consisting of terrariums about 1 meter (3 feet) in height and constructed as 'escape­ proof units' are all equipped with sophisticated temperature controls; it definitely radiates with an aura of acute professionalism. These terrariums are home to approximately 40 animals,almost all of which have a name, but these are set aside to the inquisitive eyes of the visitors. 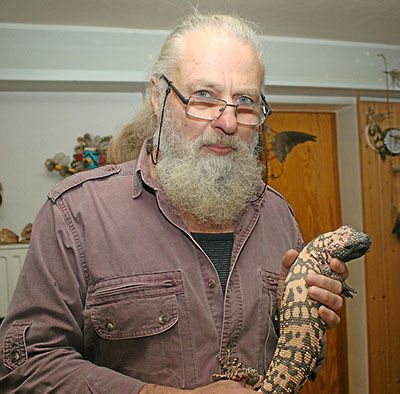 Schwandt has an extensive and extremely detailed scientific account about Gila Monsters on the Internet at www.heloderma.net. When he removes one of the lizards out of its domicile he does so with a firm and assuring grip. For a moment it hisses slightly, but it recognizes Schwandt's voice and allows itself to calm down thru assuring words. "These fellows become quite trustworthy," Schwandt volunteers, "but nevertheless outward caution is always recommended." In the past this 'monster expert' also kept and cared for a variety of rattlesnake species. Basically the same applies for Gila Monsters as for rattlesnakes: "A bite occurs when a person deliberately disturbs the animal, meaning the end result is the fault of the human intruder," explains our expert. Under normal circumstances the venom of Gila Monsters is not deadly for humans. However, a bite does result in several days of swelling and acute pain; these symptoms usually subside in several days. Today no new special permits are issues in Hessen for the keeping of venomous animals. "I have a special permit to keep and breed these lizards, in addition to import and export transactions," explains this retired pharmacist. He became deeply involved with reptiles during his academic years in the USA. Today the possibility of obtaining the aforementioned special permit, even after an official veterenarian certificat of expertise ("Sachkundenachweis") how to keep reptiles, is out of the question. "The county Hessen in Germany (in which the city of Asslar is located) does not accept established credentials, but did 'grandfather' in those that existed. But again, keeping venomous reptiles on a new basis is totally out of the question," admits Schwandt, who specializes in breeding color variations and who already sent his 'loveable fellows' to zoos in Spain, France, Italy and Switzerland. And the care for these animals? "That's not a hobby like collecting stamps," replies this reptile expert with a smile on his face, who is feeding his captives with mice. Just now he changed the sand in his terrarium, a time consuming task of measured intervals. For each terrarium it takes five buckets of sand that must first be dried completely, explains Schwandt. Caring for my animals becomes more complicated, time-consuming and definitely demanding should any of them become sick. In this respect he can count on the expertise of the Berlin Laboratory EXOMED and Schwandt proudly continues with: "It all comes down to the responsibility I have for my animals." Additionally: already as a child and born in Berlin, he already showed a keen interest in reptiles, collecting salamanders in bomb trenches. "That has always been a theme," admits Schwandt. Image: Mating pair, male on top. 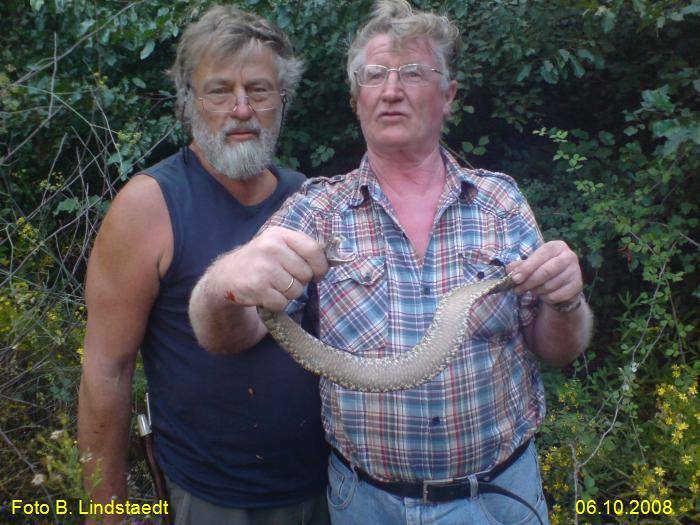 Hans-Joerg Wiedl ("Snake George") holding a Lebetine Viper (Macrovipera lebetina cypriensis). In 1992 Hans-Joerg Wiedl rediscovered the Cyprian Grass Snake (Natrix n. cypriaca). Since this time, he has been breeding this species in his outdoor tank. One of his main goals is the enforcement for the protection of the herpetofauna of Cyprus. 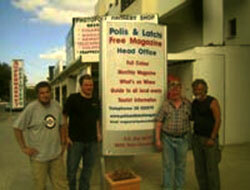 Mr. Wiedl gives lectures at his snake park in Paphos and rescues snakes should they enter peoples houses. With his lectures he educates the people to respect snakes and not to "hate" them. George, we thank you for your professional teaching and numerous field trips. Commentary of the WEB-author: EXENDIN-4 (Exenatide) is a consistuent of Heloderma suspectum VENOM (see Ref.1). Most people, when asked to name a venomous reptile would think of a snake, and would probably not even realize that there are two species of venomous lizards. The gila monster, Heloderma suspectum, and the Mexican beaded lizard, Heloderma horridum, are the only extant venomous lizards known to exist today. They are large lizards found in the Sonoran Desert of North America, and are the only members of the reptilian family Helodermatidae. Due to their secretive lives, much remained unknown about them up until the last few decades. In fact, many scientists debated as to whether they were venomous. In spite of recent discoveries, much remains unknown about the helodermatids. The venom has been studied as far back as 1891, but it is only recently that much of its biochemistry has been elucidated. The venom is principally a neurotoxin that causes respiratory failure. It is not as potent as rattlesnake, cobra or black widow venom and would probably require at least half a mL to kill a human. A variety of warm blooded vertebrates are more susceptible than cold blooded vertebrates. The gila monster's venom apparatus is far different from that of venomous snakes. In both, venom is introduced by means of capillary action via grooves in particular teeth. The main difference between the two is that in the gila monster, the lower rather than the upper teeth are grooved. The groove is not a complete canal, but nevertheless is efficient enough to envenomate prey. These lizards have a characteristic tenacious bite in which they hold on. During this time they tend to gnaw, which seems to aid in the delivery of the venom (Bogert and Martin del Campo, 1956). The venom is introduced on both sides between the lower jaw and cheek by a duct that serves inferior labial glands. These glands are multi-lobular and together may be able to produce as much as a mL of venom. Snakes and lizards both comprise the reptilian order squamata, and are thus closely related, so it is not a suprise to find that their venoms are similar. Since many more studies have been performed on snake venoms, I will first discuss them and will finish with a description of helodermatid venom. It is believed that the use of venom is for primarily the capture of prey, rather than defense. Venoms are usually broadly classified in snakes as being mostly myotoxic or neurotoxic. However, this is a generalization, for venoms have multiple physiological, pharmacological and biochemical actions. Venoms contain a complex mixture of bioactive molecules that is species specific. Each component alone may have pronounced effects or may act synergistically with other components of the venom. Some components have more than one bioactivity (e.g. possessing both kinin-like and phospholipase-A2-like activity). Some components may act on various organs of the prey, while others may assist in the penetration and absorption of the venom. In colder climates, snake venom may play an important role in external digestion of prey. This is important since reptiles are ectothermic (i.e. they rely on the environment for body heat). In cold environments, digestion may be too slow, which may lead to putrefaction of ingested prey. Therefore, any external digestion that occurs would be an advantage to snakes living in cold environments. Studies of whole venom of helodermatids have been used to characterize the toxic nature and to determine the relationship these lizards have with snakes. The whole venom was found to be heat stable and to hydrolyze L-Phe-L-Phe, resembling that of the elapids (cobras and sea snakes). These snakes are the more primitive of the venomous snakes, and it is thought that helodermatids might be more closely related to them (Tu and Murdock, 1967). The venom is not highly toxic to man. Most bites result only in painful swelling at the localized area of envenomation. There have been isolated cases of fatality, but alcohol intoxication seems to have been the major factor. 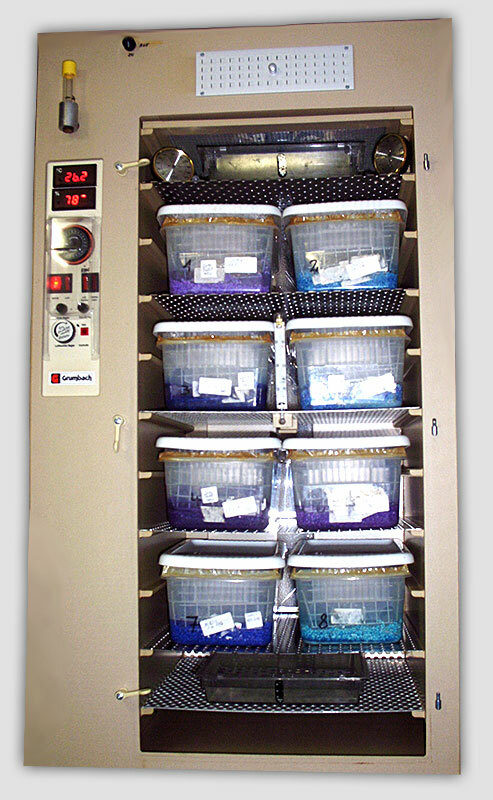 The action on lab animals (mostly guinea pigs and other small rodents) varies widely. Intravenous injection of whole venom had a LD50 (quantity required to kill fifty percent of test animals) of 2.7 æg/g whereas that of the purified gilatoxin had a higher LD50 of 2.9. This further illustrates how the components of the venom act together to produce the toxic effects. Three different toxic elements have been described. The glycoprotein gilatoxin is reported to be the major toxic element (Utaisincharoen, et al, 1993). It has a Mr of 35,000. Another glycoprotein called hemorrhagic toxin (Mr 31,000) has also been reported. Lethal toxin has also been discovered in the venom of H. horridum (Komori, et al, 1988). All three are proteolytic and cause hypertension. Helodermatid venom also contains phospholipase-A2 (Mr 19,000) (Sosa, et al, 1986). Phospholipase-A2 enzymes are found throughout nature performing a variety of functions. They catalyze the hydrolysis of phospholipids at the second carbon position of glycerol esters. Much research has been performed on snake and helodermatid phospholipase-A2s. Phospholipase-A2 is one of the twenty or so components found in venoms, but it may constitute up to 10% of the dry weight (Tu, 1991). In fact, many phospholipase-A2 enzymes are actually responsible for lethality. Most lethal phospholipase-A2 enzymes can be characterized by their neuro- and myotoxicities. Neurotoxic phospholipase-A2s act at the presynaptic axon terminal of the peripheral nervous system where they cause an initial increase and then a decrease in acetylcholine (Ach) release (Tu, 1991). Ach is responsible for delivering the impulse from nerve fibers to muscle fibers. The lowering of Ach release caused my neurotoxic phospholipase-A2 may lead to paralysis and respiratory failure as the impulse to contact is no longer able to be transmitted to the muscles. Myotoxic phospholipase-A2 act by depolarizing muscles and cause necrosis of muscle tissue. This necrosis is responsible for much of the pain associated with envenomation. Most phospholipase-A2 activity falls somewhere in between these two extremes, and it is thought that this is the case with helodermatid phospholipase-A2. Helodermatid venom also contains hyaluronidase (Mr 63,000) specific for the hydrolysis of hyaluronic acid. Hyaluronidase can be found in a multitude of animals. It has been found in many snake venoms. It has been called the spreading factor because it enhances the dispersion of the venom into the tissue of the prey. The tests on the hyaluronidase of helodermatid venoms gave sound proof for its role as a spreading factor. Hemorrhagic protease of a snake was injected along with helodermatid hyaluronidase and showed an increase in hemorrhage relative to the hemorrhagic protease alone. Phosphomonoesterase and phosphodiesterase have also been isolated from helodermatid venom, but the significance is not yet understood. These may act together with other components of the venom or may have other functions yet to be discovered (Tu, 1991). Of the proteases present in helodermatid venom, the most studied is the kallikrein-like arginine ester hydrolase (Mr 63,000). It is a member of the serine protease family of enzymes. Kallikreins release kinins which lead to hypotension. Injection of the venom into rabbits caused death by hypotension and it is thought that the presence of the kallikrein-like enzyme is responsible. Kallikreins are also involved in the processing of prohormones and therefore may play a part in the activation of venom precursors (Alagon, et al, 1986). The venom of helodermatids was found to increase enzyme secretion in a pancreatic acinar preparation, at similar levels as does vasoactive peptide (VIP), or secretin. It also caused a similar increase in intracellular cAMP. It was concluded that the venom contained a biopeptide (secretagogue) that stimulates pancreatic enzyme secretion by interacting with VIP receptors. It was later found that the secretagogue activity of the venom was due to actually two distinct bioactive peptides. Helodermin (Mr 5,900) found in H. horridum is responsible for the increase in levels of cAMP, whereas this function is performed by two distinct proteins in H. suspectum. These two proteins are helospectin-I, and helospectin-II (both with Mr 4,200) (Parker, et al, 1984) Helospectin-I is a 38-residue peptide with the structure: H-S-D-A-T-F-T-A-E-Y-S-K-L-L-A-K-A-L-Q-K-Y-L-E-S-I-L-G-S-S-T-S-P-R-P-P-S-S. Helospectin-II is identical to helospectin-I except that is lacks the last serine. Increases in enzyme secretion from the pancreatic acini is also due to pancreatic stimulatory factor (PSF, Mr 17,500) (Vandermeers, et al, 1984). This elicits no increase in cellular cAMP levels as it does not interact with VIP receptors. It is thought that PSD interacts with secretin receptors instead (Dehaye, et al, 1983). These secretagogues have become more specifically referred to as exendins in the helodermatids. That is, peptides that are found in the exocrine secretion (venom) that have endocrine activity (e.g. pancreatic secretagogues). Therefore, helospectin-I and helospectin-II are referred to as exendin-1 and exendin-2, respectively. Exendin-3 was also found (Raufman, et al, 1991). It is 48% homologous to human glucagon with the sequence: H-S-D-G-T-F-T-S-D-L-S-K-Q-M-E-E-E-A-V-R-L-F-I-Q-W-L-K-N-G-P-S-S-G-A-P-P-P-S (Eng, et al, 1990). Exendin-4 has also been described. It is the same as exendin-s except that it has G-E instead of S-D for amino acids 2 and 3, respectively (Eng, et al, 1992). Both of these act similarly on pancreatic preparations by both stimulating increase in cellular cAMP and enzyme secretion. They are thought to play similar roles in the pathology of the venom. Pancreatic secretagogues are important components of many venoms because they play a major role in their effects. Pancreatitis has been reported after certain scorpion bites (Raufman, et al, 1982). Secretagogues of non-mammals are thought to be precursors of certain bioactive molecules found in mammals. Raufman and coworkers therefore concluded that the secretagogue of helodermatid venom "... is structurally related to but distinct from VIP", the mammalian hormone which stimulates the pancreas to secrete enzymes. A very interesting new medical breakthrough in diabetes treatment has resulted from the discovery of exendin-3. Amylin Pharmaceuticals, Inc. believes that exendin-3 and its analogs may be beneficial in the treatment of both type I and type II diabetes. It has been found that exendin-3 suppresses the rise in blood glucose levels that occurs after meals in diabetic patients, as well as, stimulating insulin secretion. Exendins also modulate gastric emptying which can slow the entry of glucose into the blood. In conclusion, the venom of helodermatids is complex and similar to that of snakes. The venoms are composed of a mixture of at least twenty bioactive molecules. The toxic nature is probably not due to just one fraction of the venom, but rather, due to the complex biochemical, pharmacological, and physiological interaction of all the components. Recently, new hope for the treatment of diabetic patients has resulted from research on helodermatid venom. It is interesting to note that a feared lizard is now being looked upon to treat a disease. At one time, these lizards were killed on sight and were drastically reduced in numbers, but hopefully with this new medical breakthrough, biodiversity might be seen as an asset to human health. If these lizards would have been driven to extinction, this new treatment could not even be postulated. Alagon,A., L. Possani, J. Smart, And W. Schleuning. 1986. Helodermatine, a kallikrein-like hypotensive enzyme from the venom of Heloderma horridum horridum (Mexican beaded lizard). Journal of Experimental Medicine, 164: 1835-1845. Bogert, C. and R. Martin del Campo. 1956. The gila monster and its allies. Bulletin of the American Museum of Natural History, 109. Dehaye, J., J. Winland, P. Michel, P. Robberecht, M. Waelbroek and A. Vandermeers. 1983. Pancreatic secretory factor from gila monster venom. FEBS Letters, 166(2): 283-287. Eng, J., P. Andrews, W. Kleinman, L. Singh, and J. Raufman. 1990. Purification and structure of exendin-3, a new pancreatic secretory factor isolated from Heloderma horridum venom. Journal of Biological Chemistry, 265(33): 20259-20262. Eng, J., W. Kleinman, L. Singh, G. Sings, and J. Raufman. 1992. Isolation and characterization of exendin-4, an exendin-3 analog from Heloderma suspectum venom. Journal of Biological Chemistry, 267(11): 7402-7405. Komori, Y., T. Nikai, and H. Sugihara. 1988. Purification and characterization of lethal toxin from the venom of Heloderma horridum horridum. Biochemical and Biophysical Communications, 154(2): 613-619. Parker,D., J. Raufman, T. O'Donohue, M. Bledsoe, H. Yoshida and J. Pissano. 1984. Amino acid sequence of helospectins, new members of the glucagon superfamily, found in gila monster venom. Journal of Biological Chemistry, 259(19): 11751-11756. Raufman,J., L. Singh and J. Eng. 1991. Exendin-3, a novel new peptide from Heloderma suspectum venom, interacts with vasoactive peptide receptors and a newly described receptor on dispersed acini from ginuea pig pancreas. Journal of Biological Chemistry, 266(5): 2879-2902. Sosa, B., A. Alagon, B. Martin, and L. Possani. 1986. Biochemical characterization of the phospholipase-A2 purified from the venom of the Mexican beaded lizard (Heloderma horridum horridum). Biochemistry, 25: 2927-2933. Tu, A., ed. 1991. Handbook of natural toxins, vol. 5. Reptile venoms and toxins. Marcel Dekker Inc., New York. Utaisincharoen, P., S. Mackessy, R. Miller, and A. Tu. 1993. Complete primary structure and biochemical properties of Gilatoxin, a serine protease with kallikrein-like and angiotensin-degrading activities. Journal of Biological Chemistry, 268(29): 21975-21983. Vandermeers, A., M. Vandermeers-Piret, P. Robberecht, M. Waelbroeck, J. Dehaye, J. Winland, and J. Christophe. 1984. Purification of a novel pancreatic secretory factor (PSF) and a novel peptide with VIP- and secretin-like properties (helodermin) from gila monster venom. FEBS Letters, 166(2): 273-276. Late in May, 1889, through the kindness of Miss Mary Woodman, the Museum of Comparative Zoology at Cambridge, Mass., came into possession of an unusually handsome specimen of the "Gila monster," one of the hugest of the lizards and the only one reputed venomous. He had been secured at Casa Grande, Arizona, by Mr. Daniel H. Bacon and forwarded in such a manner as to reach us little the worse for the handling and the change of climate. His arrival in good health and in the warm season gave opportunity for taking a number of notes that may add something to what is already known concerning the species. For more than a year he was kept alive and under observation. Animals that have been brought any distance usually arrive very thirsty, and the first move toward domesticating them is made in serving them water. Heloderma was no exception. In an arid dwelling place such as his, four or five days, the length of the journey, would not be expected to prove a very long time between drinks, but he drank as if nearly famished. A stupid and impassive appearance did not prevent such manifestation of intense enjoyment as made it a pleasure to watch the slow process of satisfying what, for the time, was the greatest desire of the creature's existence. More than half an hour elapsed from the time the snout was brought down to the liquid and the tongue thrust into it until the head was raised and, licking the lips and yawning to disclose the inky blackness inside the mouth, preparations were begun on a sleeping place. Shortly afterward an egg was broken into a dish and placed within reach; it was taken with evident relish, in the same manner as the water ; the chin was dipped into it and the tongue thrust out, bent downward and drawn back again. The tongue is thick and riband-shaped, i. e., long, narrow and somewhat depressed. In protrusion it first makes its appearance as a single sharp point; as it comes farther out the tip separates into two points, and the organ is seen to be forked for a short distance. When fully protruded, the aspect is changed and the outline of the extremity, as seen from above, resembles that of the tall of a shad. As the tongue is drawn in, the tips approach each other till once more closely applied. Thus, the forked portion moves sidewise like the blades of a pair of scissors as the tongue goes out and back. Any of the fluid that adhered was carried into the mouth by the retraction, and no doubt the tongue was followed by a slight current induced by suction that took in a little more ; the amount of suction, however, must have been very slight, judging from the time occupied in eating a single egg. On each of four days one egg was consumed ; then followed a week of fasting, the most of which was cloudy weather. Readiness to feed depended greatly on the temperature and brightness of the day ; in consequence the meals were quite irregular. On the bottom of the box there were some inches of sand with several rocks ; under the side of one of the latter the burrow was made. The digging was all done with the hands ; beginning with the left the sand was thrown back with some force in slow strokes, about thirty to the minute, then the right was used in the same way. The motions were outward or lateral, not vertical like those of a dog. For a while the sand was dug out directly until it began to pour back ; then a position was taken up on the top of the heap that had been made, and it was thrown still farther back ; gradually working forward, conditions were soon made favorable for continuance of excavation at the bottom of the burrow. At the depth of about a foot the body was hidden and only the tail exposed. This depth appeared to be satisfactory for a time, and the dwelling was occupied as if complete. The tail is club-shaped, near six inches in length by one and a half in diameter, and retains its thickness back toward the end where it rather abruptly tapers to become more slender and pointed. When the tail was sticking out of the excavation, as in digging, the slender extremity moved from side to side, back and forth and around, with more flexibility than was to be expected from its size, as if constantly on the alert for unseen danger. The organ is very sensitive. While asleep the tail was stowed as if to insure its safety ; it was either extended directly back into the burrow, half of the body remaining outside, or, when the animal was wholly under cover, it was bent forward along the side. In sleep, the body lies flat on the sand and the arms were usually stretched back, palms upward. After a few weeks, less care was taken in regard to entering the burrow during the day, and the naps were taken anywhere in the box. The box was not well placed for the sunshine; it was covered with a strong netting. Some attempts to get through the net one morning caused the occupant to be taken by the shoulders and lifted over into another cage where he might get the full benefit of the sun. This was quietly enjoyed until the sun had passed, then there was another attempt on the cover, followed by return to the first box and retreat into the hole. This came to be the regular proceeding : every morning about nine o'clock the fellow climbed up in the corner of his box whence he was lifted over into the sunshine to take a nap until the shadows came upon him, then he would climb in the corner again till returned to the larger box to take his favorite position in his den for a while. To forget or neglect him was out of the question ; his scratching would not permit it. The number of eggs charged to him does not average more than one per week; the other food given him amounted to very little. In the latter part of July he began to slough. The epiderm came off in a very ragged way, in shreds and patches. There seemed to be no effort to hasten the process and a month later it was not entirely finished. Thinking to hurry the matter, in case all had not gone along in the normal way, a bath tub was furnished with water sufficient to completely cover him. At once he showed a fondness for lying in the water with his snout sticking out; this was varied by lying on the bank with his tail sticking in, a position which he apparently found to be very delightful. Heloderma was really good-natured. To be sure he was easily worried into self-defence, but there was nothing vicious in his disposition. To scratch him on the sides, or rub the knobbed scales of his back, or, more readily than either, to blow in his face would make him open his mouth, for which he was not much to be blamed, but even then something had to be put between his teeth to get him to bite, he had so little desire to take hold of his tormentor. His thirst required more attention than his hunger ; he drank frequently and always with great deliberation. To tempt his appetite various things, such as insects, worms, young birds, mice, meats and cooked foods were put before him. He took none of them voluntarily, but would swallow occasional offerings if they were put into his mouth. Some things he would not accept on any terms, they were put out of the mouth as fast as put in ; others that he might be induced to swallow were held in his jaws for a long time. At the end of a year the only evidence of loss of flesh was to be noticed near the end of the tail, where it had grown a little more thin and pointed. The body had retained its plumpness, being rather more than three and a half inches wide to twelve inches long, without the tail. His only sound was a long-drawn aspirate hah, like a sigh, produced by expelling the breath from the lungs. If teased till out of patience, this was given out with the mouth partly open, when it had all the force of a warning ; whether it was intended for that purpose or was merely preparation for a struggle, by lessening the bulk, are still to be considered. It really answered both purposes. In regard to the nature of the venom and fatality of the bite there is little to offer that is new. The results of the experiments suggest danger for small animals but little or none for larger ones. Large angle worms and insects seemed to die much more quickly when bitten than when cut to pieces with the scissors. Acquaintance with this specimen has satisfied me, however, that the reports of the deadly nature of the species are mainly exaggerations, with little if any foundation in fact. 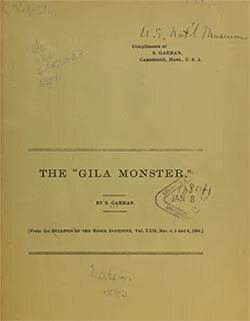 Popular opinion and for that matter its manner of origin are illustrated by the following, credited to Col. A. G. Tassin, U. S. Army, in the Overland Monthly : "The Gila monster is an ugly reptile peculiar to Arizona, and as its name implies, most common along the Gila river. It is a sort of a cross between a lizard and an alligator, "roughly striped black and white on a yellowish back- ground. Its length varies from ten to thirty inches, and a large-sized fellow is as thick as a strong man's arm. When prodded with a stick it hisses and thrusts out its heavy forked tongue, raising its head menacingly, but scarcely moving otherwise. Its bite is often fatal, the effect depending more or less upon the state of the sau- rian's temper and the depth of the wound. Its breath in hissing is offensive, and issues from a wide-open mouth in puffs of black vapor or smoke. The Mexicans I have questioned all told me that it was exceedingly poisonous, as much so as the bite, if not more, while many of the Americans thought it harmless. Having myself seen a chicken and a small puppy killed by the hissing of one in their faces, I am inclined to think that it is best to keep from coming in contact with it." Comment on this is unnecessary. Still more conclusive in its way is the following, originally from the Cochise Record, reprinted without comment in the Proceedings of the Zoological Society of London, 1888 : " Sunday evening Dr. Mathews was summoned, by telegram, to Fairbanks (a railway- station near Tombstone, Arizona Territory, U. S. A. ), to attend Colonel Yearger, who was reported seriously ill. Owing to delay in the telegram, the doctor did not reach the patient until several hours after his death, which had been very sudden. It appears that Yearger had been fooling with a Gila monster and in attempting to open the creature's mouth, was bitten on the right thumb. Instantly the poison took effect, and although every convenient remedy was ap- plied, he lived but a few hours. An inquest was subsequently held, and a verdict returned in accordance with the above facts. As this is the third or fourth death which has occurred "in the Territory from bites of this reptile, it should set at rest, at once and forever, the theory so prevalent that their bite is not poisonous." For comparison with the foregoing we may bring forward the evidence of a couple of witnesses of scientific reputation. They have no interest in destroying the character of the accused and may be expected to give testimony without prejudice. If they are less positive in their assertions than the preceding, it is possibly due to their actual acquaintance with the creature. Dr. F. Sumichrast under date of 1880, in the Bulletin de la Societe Zoologique de France, page 178, remarks concerning Heloderma horridum: "J'ai peu de chose á ajouter aux observations de moeurs que j'ai publiées sur cette espèce, il y a quelques annèes, si ce n'est, qu'après de nouvelles expériences sur sa morsure, je suis arrivé à la conviction qu'elle occasionne rarement lamort chez les animaux d'une certaine taille et que, la plupart du temps, elle n'est suivie que d'une enflure de la partie mordue qui disparait au bout de vingt-quatre heures au plus ; c'est au moins le seul effet qu'elle ait produit sur plusieurs jeunes chiens que j'ai fait mordre dernièrement." Dr. R. W. Shufeldtis one who, from having been incautious enough to get bitten, is entitled to speak with some degree of assurance. His statement is found in the American Naturalist for 1882, page 908. He was bitten on the right thumb, the teeth going to the bone, by a specimen at the Smithsonian Institution. The lacerated wound was in a few moments the starting point of severe shooting pains that passed up the arm and down the corresponding side. A profuse perspiration was induced. The pain made him so faint as to fall. The hand swelled rapidly, but the swelling went no farther than the wrist. The treatment included suction which drew not a little blood from the wound, a small quantity of whiskey, external application of ice and laudanum and a lead-water wash afterward to reduce the swelling. He passed a sleepless night. By the next day the swelling was considerably reduced and thereafter disappeared gradually. The following is the conclusion of the doctor's statement: "Taking everything into consideration, we must believe the bite of Heloderma suspectum to be a harmless one beyond the ordinary symptoms that usually follow the bite of any irritated animal. I have seen, as perhaps all surgeons have, the most serious consequences follow the bite inflicted by an angry man, and several years ago the writer '' had his hand confined in a sling for many weeks from such a wound administered by the teeth of a common cat, the even tenor of whose life had been suddenly interrupted." The most conclusive of my own experiments on the subject of this notice, H. suspectum, eighteen inches in length, was made with a young cat less than one-third grown. The cat was bitten on the right hand and wrist, the lizard holding fast like a bull dog, and blood was seen to flow when they were released. That there might be no doubt of the effectiveness of the bite, in two minutes the teeth were inserted a second time, the saurian retaining his hold and sinking his teeth deeper as the cat struggled to get free. For half an hour or more the wound occasioned some distress and was licked and dressed by the kitten, which then went to sleep for about an hour and a half. In expectation of its death it was left undisturbed. To my surprise it awoke as lively as if nothing had happened. Though the hand was somewhat swollen, it was but slightly lame. Twenty-four hours afterward when it was as bright as ever and apparently without ill efiects from its mishap, the same cat was again bitten twice on the forearm, a little higher than before. As in the first experiment there was no room to doubt the penetration of the teeth. The cat again licked the wounds and for a considerable time was occupied in dressing them. There was no disposition to go to sleep as on the day before. In two hours, as soon as the cat was inclined to pay no farther attention to its wounds, it was killed and the skin removed the better to note the effects of the bites. The fore-arm and hand were found to be swollen to twice the size of the opposite hand and arm. The track of each tooth was marked by the blood in and close around it, and the number and depth left no doubt of the conclusiveness of the experiment ; the teeth had gone to the bones and between them. I saw nothing by which to distinguish the cuts from those made by a needle. There were no signs of disorganization in either the first or the second bites. Nothing could be seen in the way of discoloration or otherwise to give reason for any other conclusion than that the kitten would have entirely recovered in a few hours, by the time the swelling had gone down, if it had been allowed to live. The outcome of such observations as have been made on this specimen has been confirmation of the opinion that the species is venomous to a certain degree, to an extent that, while it may most often prove fatal to very small animals, is only in exceptional instances deadly or perhaps even dangerous to larger ones. The effect on the kitten was identical with that on the puppies in Sumichrast's experiments. That poison was introduced by the bite was evident from the distress and swelling occasioned. Dr. Fischer has described and figured secretory apparatus on the lower jaws ; no glands have been found on the upper. There is an important question to be solved in connection with this apparent lack of venom-secreting organs on one of the jaws, which is quite as well prepared for its use as the other on which the glands are so well developed. On both upper and lower jaws each tooth has a lateral groove on each side ; these furrows are supposed to be for the purpose of inserting the venom in the wounds made by the teeth. Unless there are, not yet discovered, means of supplying venom to the upper teeth, it is difficult to see how their furrows are made available, if not by means of a quantity set free in the mouth, from the lower jaws, before the attempt to bite, a process of such uncertain efficacy as hardly to be considered probable. Averse to torturing the creature, no attempt was made to verify the statement made by Sumichrast concerning the habit of turning on the back to defend itself when struck or beaten with a club. However, it might be expected to do just what is asserted of it under such circumstances, for the position would be that which would enable it most effectively to use feet and claws in aid of the teeth in self-defence. The breath is no more colored than that of human beings; neither is it nor could it be any more offensive in its odor than the incense wafted from the lips of multitudes of the representatives of proud humanity. In regard to the breath being venom-laden, that of the specimen before us certainly was not so ; here again it would be no very difficult undertaking to select an army of men with whom a comparison in this respect would undoubtedly prove complimentary to the '' monster." And, finally, it may be said that unprejudiced consideration of the matter as it stands between the reptile and hig detractors will not fail to convince any one that a great deal of the disrepute with which so much of the testimony is weighted should not by any means be attached to the lizard. From the Bulletin of the Essex Institute, Vol. XXII, Nos. 4, 5 and 6, 1890.